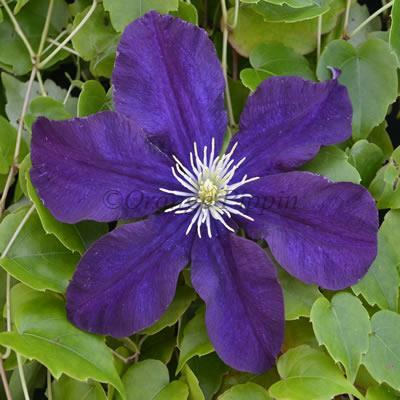 Clematis 'Warszawska Nike' has lovely, rich, deep purple flowers with golden centres from June to September. Best planted against a light background to show off the dark flower colour. This non-evergreen climber can be grown against a trellis, garden fence, wall, arches, pillars, pergolas, clambering over tree stumps and through large shrubs or planted in a container trained up bamboo canes or an obelisk. In Warsaw, Poland, 'Warszawska Nike' is a monument to the heroes of Warsaw 1939-1945, the soldiers and civilians who fought during the Second World War for the freedom of their home city.